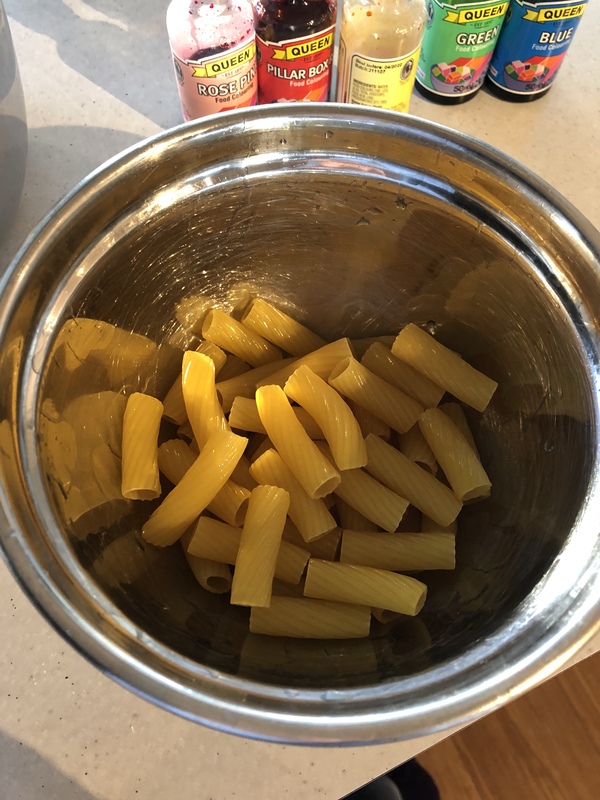 Pasta is a staple pantry item in most kitchens. 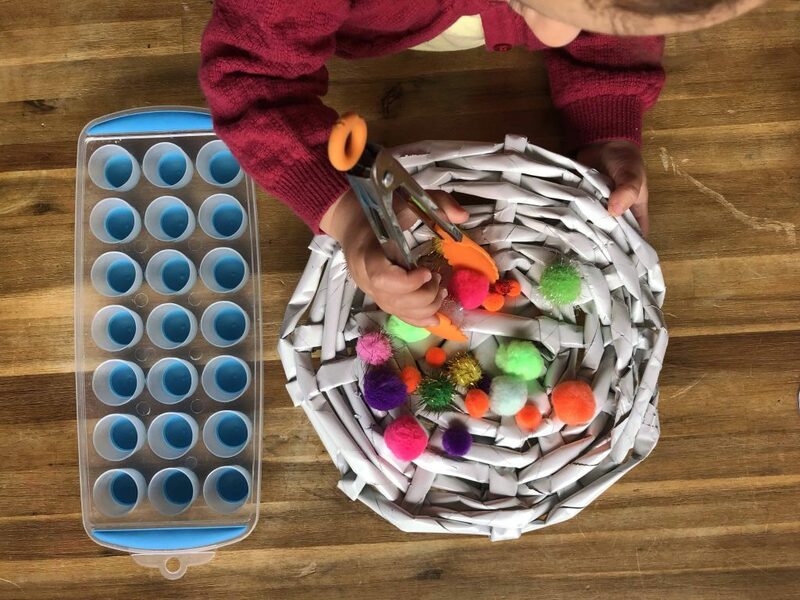 It can also be a useful resource in the playroom too! 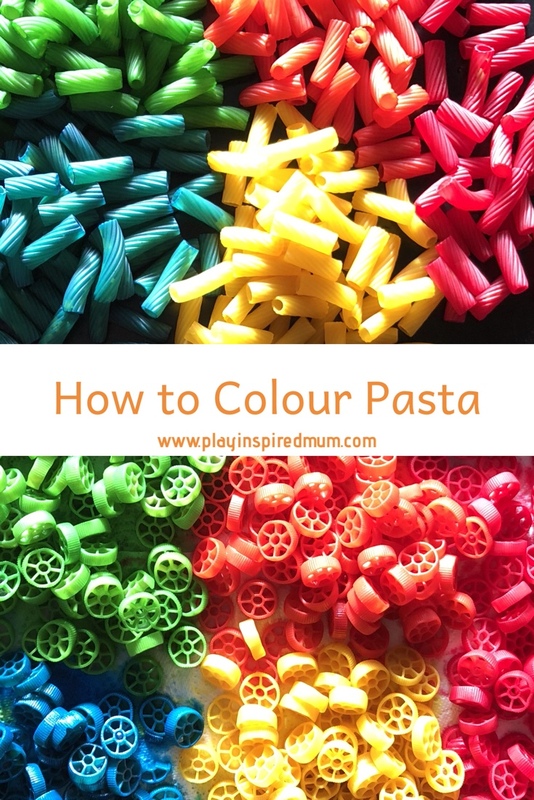 Use pasta in sensory play, small world play, craft activities and to create masterpieces! 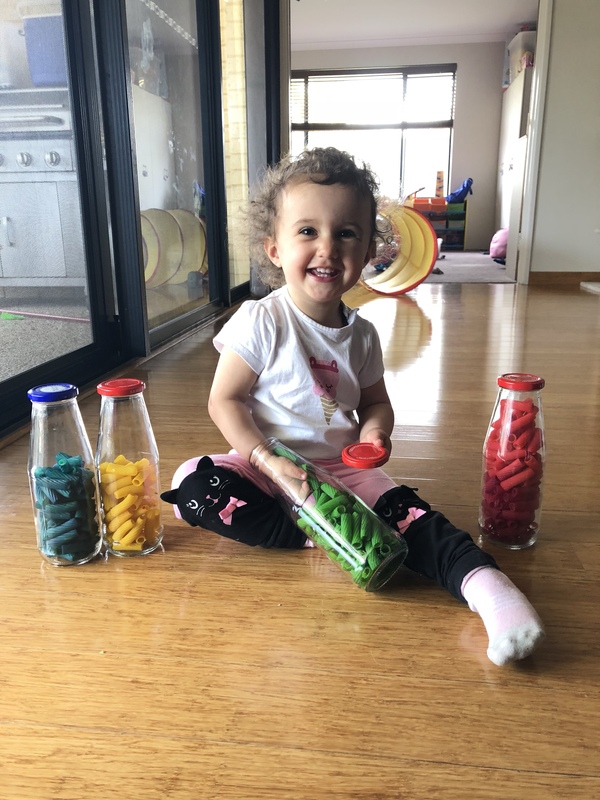 Chunky varieties are perfect for developing hands to practise threading, smaller types make for the perfect substrate for sensory bottles and the long varieties make for popular additions to sensory bins. 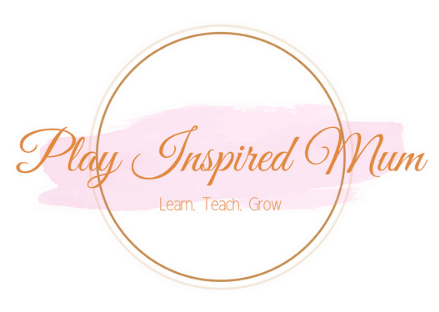 How can we take such a great resource to the next level? Purple, blue, green, yellow, orange, red, pink! 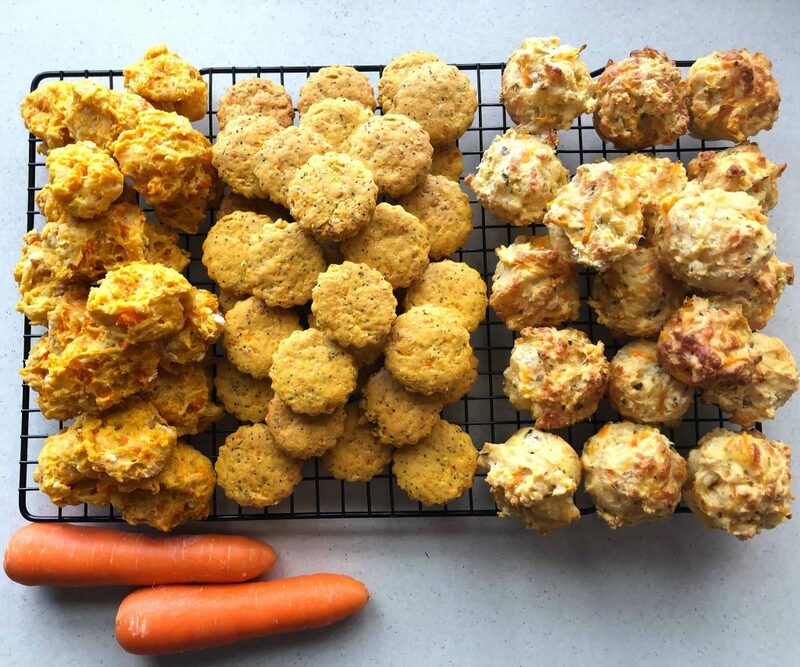 Which one to choose…. make a rainbow! It literally takes just minutes! There are two methods that I have tried. Both work however I have found that one gives a result that is much more vibrant than the other. 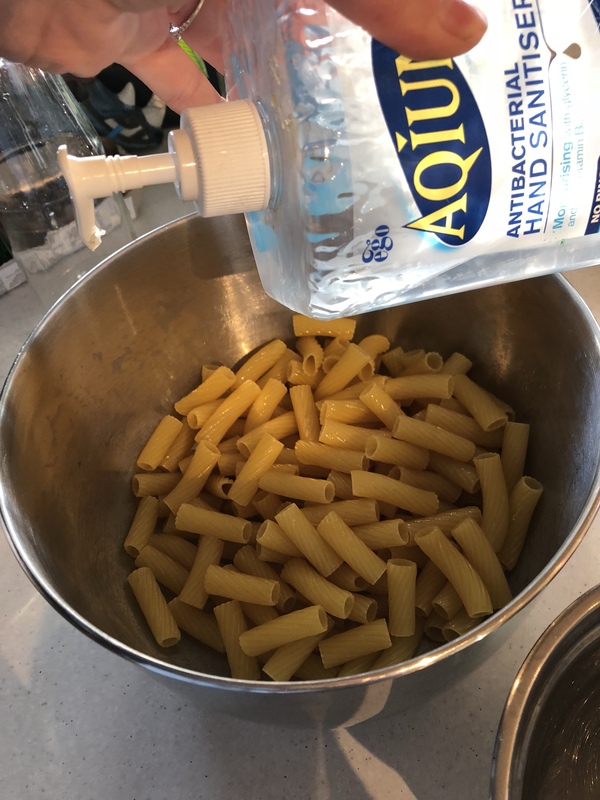 The first method I used was using vinegar. 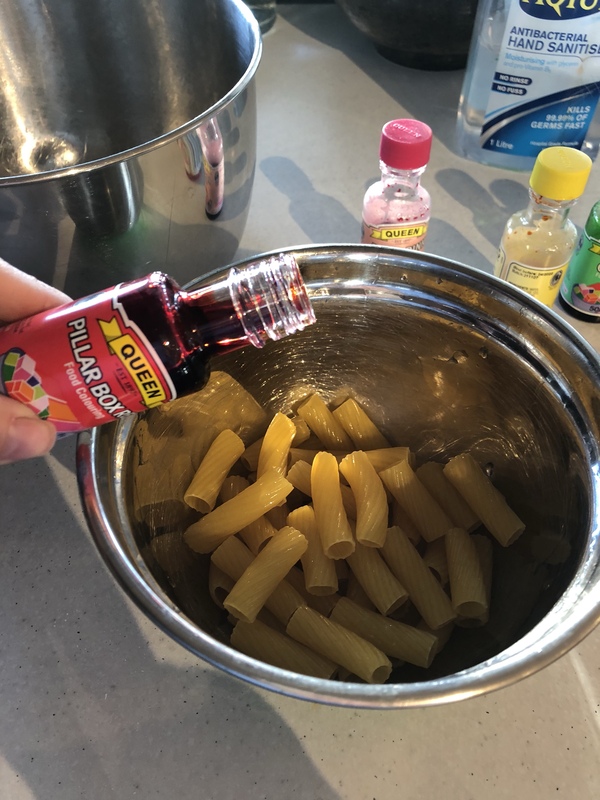 The vinegars role is to simply carry the food colouring to coat the pasta. 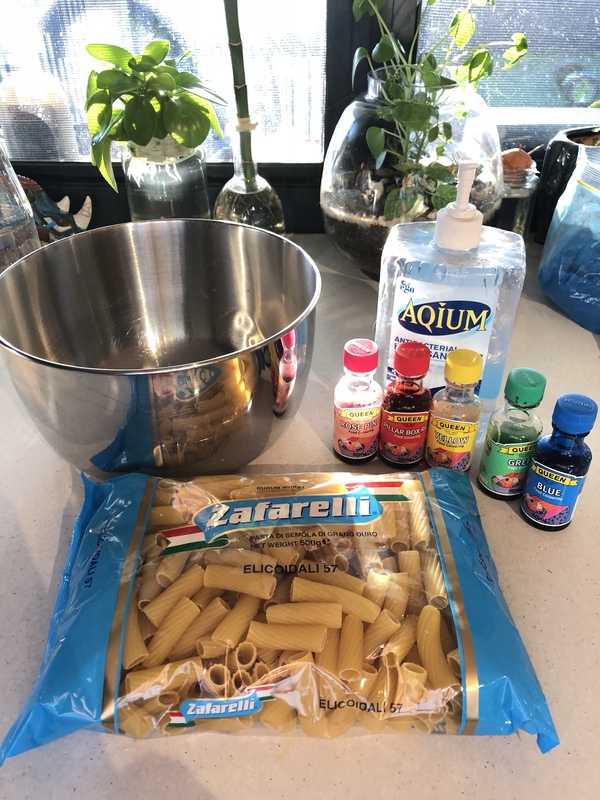 I put the dry pasta into a large bowl and then splash just enough vinegar to wet the pasta. 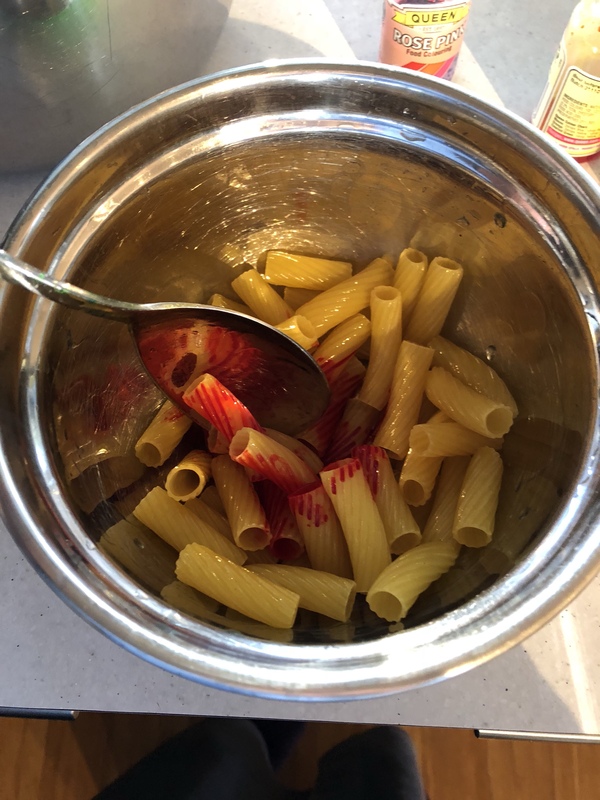 Less vinegar is more… the wetter your pasta is, the longer it will take to dry. 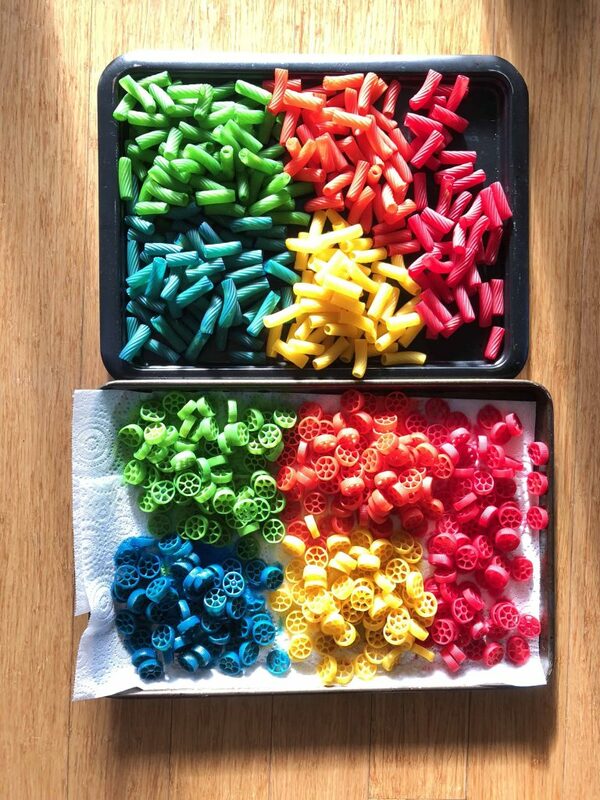 Once the pasta is wet, splash in some of your favourite food colouring and mix until the colour is even. 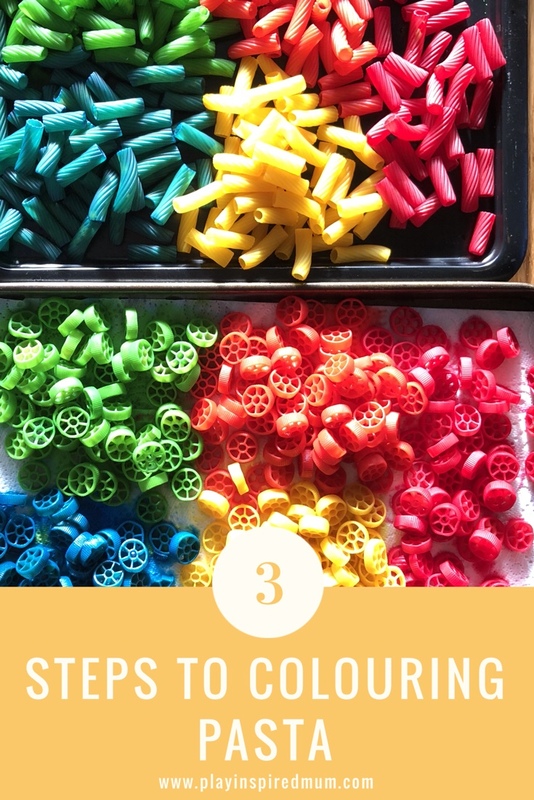 Pour your freshly coloured pasta onto a flat tray to dry before playing to avoid the colour transferring. 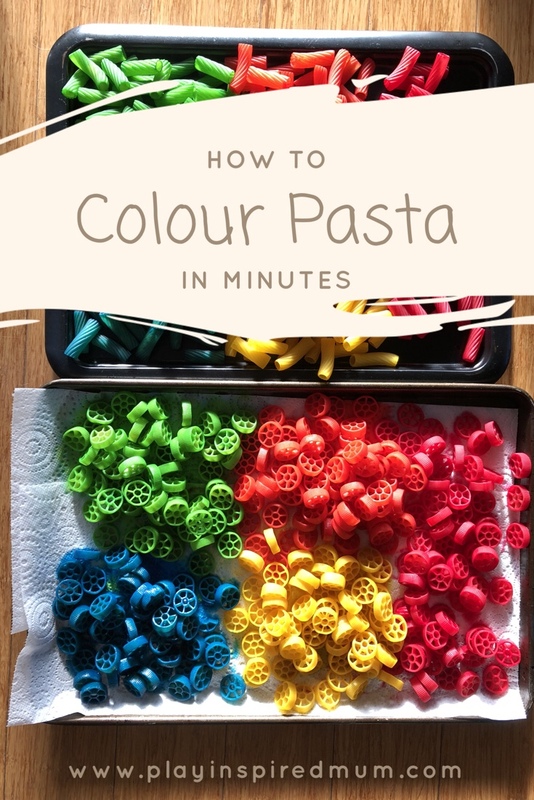 Last time I used this method, our pasta took a couple of hours to dry entirely. 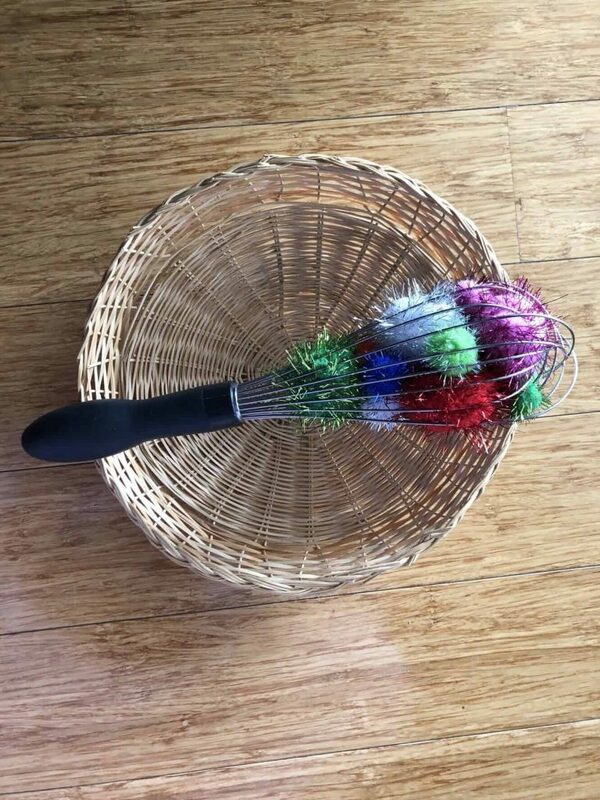 The vinegar method is a preferred choice if you are colouring for little ones who are still putting everything in their mouth. The second method is one I discovered only a few months ago. It dries quicker and the colour payoff is incredible! The difference? Simply swap vinegar for hand sanitiser. That’s it. That’s the only difference. 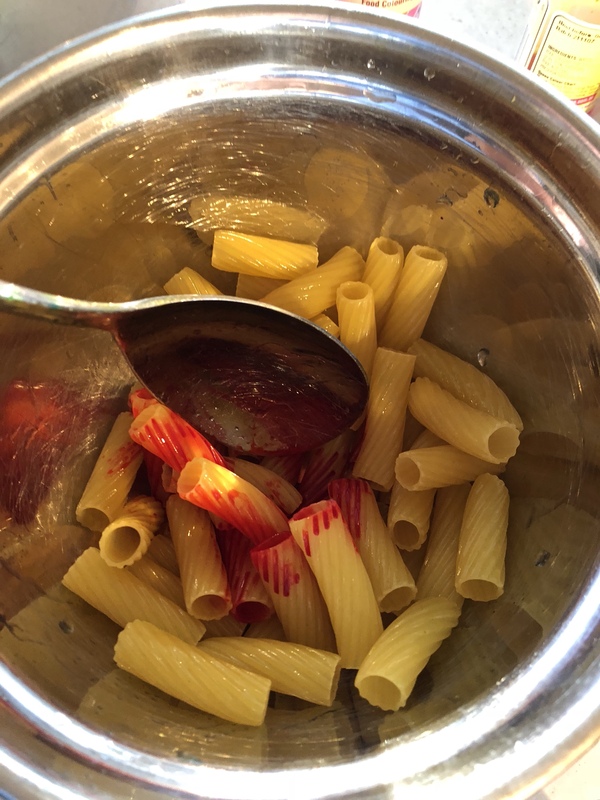 The pasta dried in a quarter of the time and the colours are so intense- it’s just gorgeous! It really is that simple! 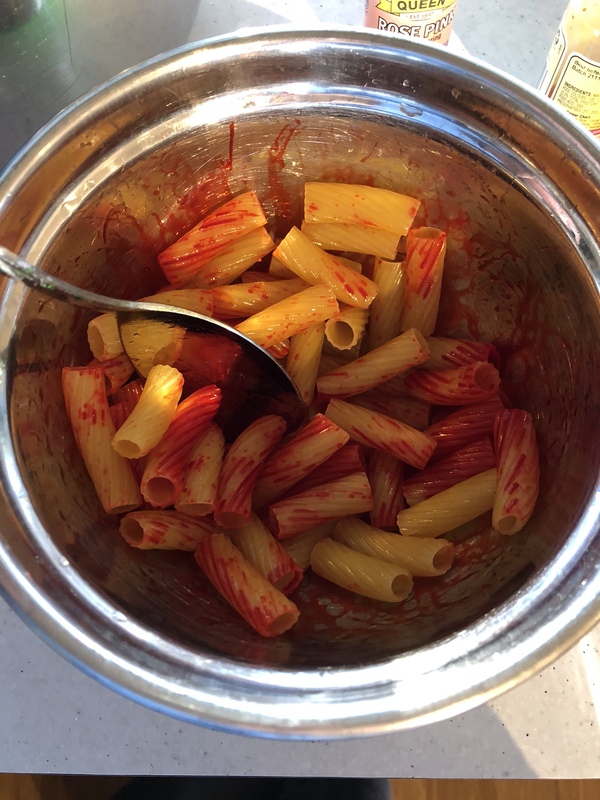 I store our dried coloured pasta in old Passata jars when they aren’t being used. If they get broken we use them to decorate crafts with. My children love gluing and broken fragments of coloured pasta are never turned away. What are you waiting for? Give it a shot and enjoy a rainbow of fun at your place too!